As you curse the rat's nest of terminals, walkways, and people movers of whatever transit hub you're using to get home this week, it's easy to forget how extraordinarily sophisticated the average airport is. They're works of art, really—but they're nothing compared to the airport concepts artists have dreamt up over the last 100 years. This week, Scientific American reports on a proposed airport for greater London, which would float a massive superstructure in the Thames estuary. It sounds like a remarkably modern idea—but it's actually been around for at least 70 years. Given that we're spending this week looking at the changing role of air travel in our world, now seems like an ideal time to parse the voluminous amount of writing that's been done on the airport proposals of yore—below, you'll find our highlights. 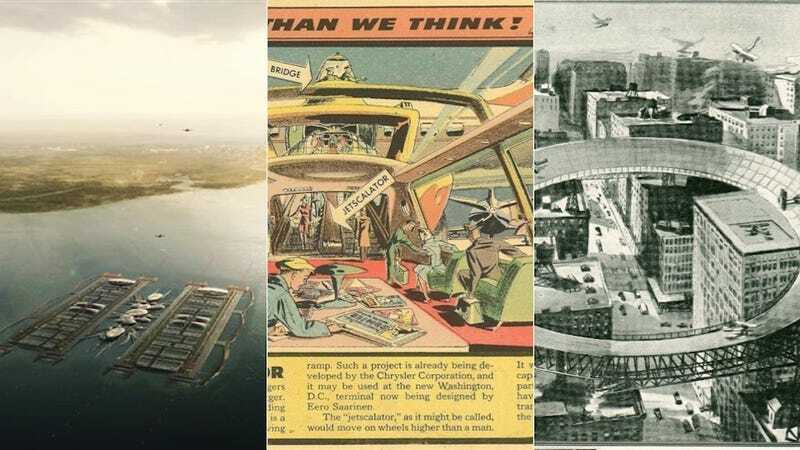 The floating airport—whether air- or sea-borne—had been a dream since the early days of air travel. Here's a case where it might be most interesting to talk about what was built: After more than three decades of theoretical concepts and proposals, the world's first floating airport—Kansai, in Japan—opened in 1994 on a 2.5-mile-long piece of artificial land. It was a solution to myriad problems with urban airports: the noise, the limited land resources, the inherent public safety issues. The only caveat? Today, it's sinking. It's one of the busiest travel weeks of the year, so what better time to take a closer look at how we get where we're going—and how we could be doing it better? Check out more of Gizmodo's Air Travel Week posts here.